Indirect Attack. A method of suppression in which the control line is located some considerable distance away from the fire's active edge. Generally done in the case of a fast-spreading or high-intensity fire and to utilize natural or constructed fire breaks or fuel breaks and favorable breaks in topography. The intervening fuel is usually backfired; but occasionally the main fire is allowed to burn to the line, depending on conditions. Interagency Standards for Fire and Fire Aviation Operations. Interagency manual containing directives specific to wildland fire operations, including chain saw use. Jackstrawed. Area where multiple trees have been blown or fallen down in crisscross fashion. Job Hazard Analysis (JHA). Describes the potential hazards of the work site, along with all agency policies, controls and work practices selected to minimize those hazards. Kerf. The slot in the wood made by the action of the saw chain cutters. Keyhole. Openings cut into continuous fuels used to dispose of cut material. Kickback. A strong thrust of the saw back towards the sawyer resulting from improper use of the top corner of the guide bar's tip. Lay. 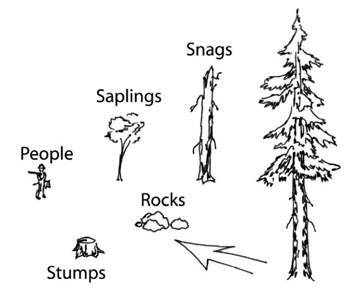 Refers to either the position in which a felled tree is lying or the intended falling place of a standing tree. LCES. Lookout(s), Communication(s), Escape Route(s), and Safety Zone(s). Elements of a safety system routinely used by firefighters to assess their current situation with respect to wildland firefighting hazards. LCES has a much broader application than just fire and should be considered as a valuable, useful tool for all field project work and activities. Examples include chain saw operations, work in confined spaces, hazardous materials, and blasting. Lean. Refers to the directional tilt of a tree away from its vertical position. 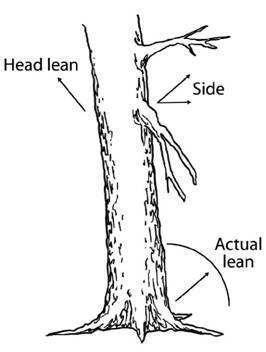 Many times two lean forces may be in play in the same tree. They are referred to as head lean and side lean. Leaner. A tree which naturally leans heavily. Leap Frog. A system of organizing workers in fire suppression in which each crew member is assigned a specific task such as clearing or digging fireline on a specific section of control line, and when that task is completed, passes other workers in moving to a new assignment. Limbing. Removing the branches from a felled or standing tree. Log. A segment sawed or split from a felled tree. MIST. Minimum Impact Suppression Tactics. Employed in areas where the visual or environmental impacts of fire suppression activities must be minimized, as in wilderness areas and national parks. MSDS. Material Safety Data Sheet. A compilation of information required under the Occupational Safety and Health Administration Hazard Communication Standard that outlines the identity of hazardous chemicals and fire hazards, exposure limits, and storage and handling precautions. NIOSH. National Institute on Occupational Safety and Health. No-Bind. One of the five basic tree positions commonly encountered while bucking. A tree in a no-bind situation is usually found on a flat lay. Notch. The section of wood removed from the face of the tree to prepare it for felling (also see facecut, undercut). NWCG. National Wildfire Coordinating Group. Sets standards for training, certification and equipment used in wildland and prescribed fire operations for member agencies. Offside. The opposite side of the tree from where the sawyer stands while bucking or felling. Open-face Cut (or open-face notch). 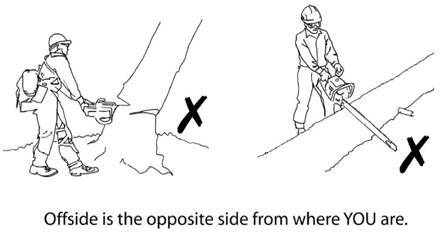 One of the types of facecuts commonly used to fall a tree. The open-face notch is cut to at least 70° (ideally 90°), with the top cut being angled downward 70° and the bottom cut angled upward 20°. The back cut is horizontal and at the same height as the corner of the notch.